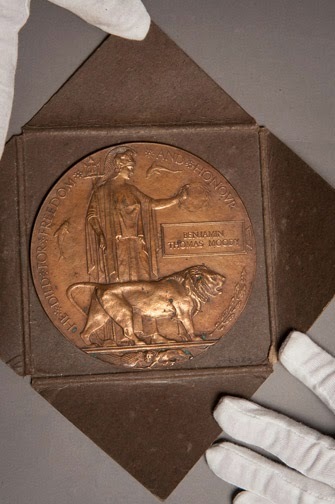 Caption: This award was sent to the family of Private Moody, after his death in 1917. He served in the 10th battalion of the York & Lancaster Regiment and is buried in Somer Farm Cemetery in Belgium. A special First World War themed event is set to take centre stage at Leeds City Museum this Saturday. As part of ‘Exploring Leeds and Yorkshire in the Great War’, which will be held on Saturday 27 September from 11-4pm, a host of experts will be on hand to listen to people’s family stories and look at items of memorabilia. People are also being invited as part of this ‘road show’ styled event to be photographed with the items and share their own story. The experts will also discuss and take questions on a range of interesting and poignant First World War themes in a panel discussion in response to questions from the audience. A number of talks, children’s activities, musical performances reflecting the period, exhibitions and displays will also be on offer as part of a packed programme in different rooms of the museum throughout the day. Included in the road show, which will be in the Brodrick Hall from 11am-2pm, is the chance for visitors to be given help by specialists to identify any medals in their possession and have any questions answered regarding their historical military, social or artistic context. Topics including‘100 years of theatre and cinema’, ‘letters from the front’, ‘Yorkshire rugby in the First World War’, ‘medals’, ‘music of the time’ and ‘a personal story’, will also feature in a programme of talks led by experts that will sit aside displays and exhibitions focusing on ‘Project Bugle’, ‘Leeds Pals’ and how the Yorkshire Post covered the war on its front pages. As part of a ‘personal story’, those in attendance can personalise their families stories and introduce their items to those taking part. In what also promises to be one of the real highlights of the event, Professor Alison Fell, (University of Leeds Legacies of War project leader) will chair an expert panel, which will see guests including John Roles (Leeds City Council’s head of museums and galleries), Dave Stowe (local historian), Andrea Hetherington (Friends of Lawnswood Cemeteries) and Jonathan Ferguson (the Royal Armouries) discuss an assortment of diverse topics which will be submitted by members of the public. Also held throughout the museum during the day will be impromptu performances from ‘Oh What a Lovely War’ and roving poetry recitals from the period, while in the Denny Room, youngsters can explore First World War objects and poems with guest writer Mary Cooper and Alison Glew. Organised in partnership with the University of Leeds, Yorkshire Post Newspapers, and the WW1 Nidderdale: Leeds Pals, POWs and the Home Front - a regional Heritage Lottery Fund project, this is an event not to be missed by anyone with an interest in the First World War. This event forms part of the city’s centenary commemoration of the First World War. "As part of the 100 year commemorations marking the start of the First World War, we are delighted to be hosting with partners this special event at Leeds City Museum, which will offer a diverse and interesting programme of activities for people of all ages. "On offer will include the chance to chat and listen to experts on a wide range of different themes through a panel discussion and public talks, and take part in a road show where you can discover more about memorabilia from the conflict that may have been passed down from generation to generation in your family. "With live performances of poetry also set to be undertaken on the day, children activities and exhibitions and displays, this promises to be a real highlight of our First World War events and activities programme." "We are delighted to be working with Leeds Museums and Galleries on what promises to be a great opportunity to share some of the things we have learnt about the war’s many different aspects, and to showcase some of the research projects the Legacies of War team have been supporting. "Dozens of projects will be highlighted and there will be talks with a broad appeal for people interested in the war and how it affected people from Leeds and the rest of Yorkshire." Admission free. Mondays closed (except bank holiday Mondays 11am-5pm), Tues, Weds and Fri 10am-5pm, Thurs 10am-7pm, Sat and Sun 11am-5pm. Millennium Square, Cookridge Street, Leeds, LS2 8BH. Established in 1821, Leeds Museums & Galleries is the largest local authority-run museum service in England and has one of the larger and most significant multidisciplinary collections in the UK. They care for 1.3 million objects which are used to inspire, educate, entertain and challenge the people of Leeds and visitors to the city. Leeds Museums & Galleries run nine historic sites and visitor attractions, which welcome over one million visitors each year, approximately 25% of all museum visits across Yorkshire. The City Museum is one of the flagship sites for the service, and is home to four floors of interactive and exciting galleries showcasing the story of Leeds, as well as the Leeds Mummy and our Designated Natural History collection.